Smyslov in Tilburg, Netherlands in 1977. 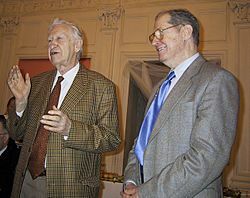 Vasily Smyslov congratulates Yuri Averbakh at his 80th birthday and presents him with a book of his own chess studies. Vasily Smyslov Facts for Kids. Kiddle Encyclopedia.